Suburban Glass and Mirror was established June 16th 1961 in Norwood, NJ by Dave Gangeri. After years of service at his Uncle’s glass shop in Cliffside Park, NJ he gained the experience and know how to confidently open his own glass shop. In its’ infancy, Suburban Glass, was a one man – one truck shop that specialized in glass replacement, mirrors, and auto-glass. The overwhelming demand spurred the acquisition of an additional location: the 418 South Broad Street building in Ridgewood, NJ in 1972. 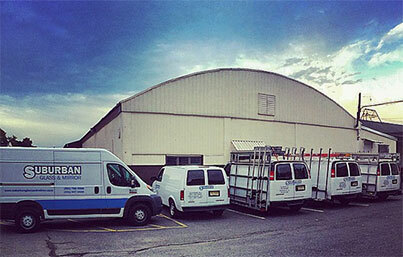 Dave’s sons Wayne and Jeff joined the Suburban Glass team; it was time to expand. By 1981 Suburban Glass had outgrown their space in Norwood, Suburban Glass moved operations to 231 Herbert Avenue Closter, NJ only a few miles away from the original location. Our commitment to quality and assurance has continued through the years while the services we offer has increased. We still offer all of the original services (minus auto-glass) and added shower enclosures (framed and frameless), storefronts, all-glass entranceways, glass railings, UV bonded glass, and smart glass. In 2002 Wayne’s son Matt joined Suburban Glass. Now a three generation family business, Suburban Glass opened an additional shop located at 143 Broadway in Woodcliff Lake NJ. Our showrooms are located strategically throughout Bergen County so our local customers have no more than a few minutes drive to visit us. The three generations of family still own and operate Suburban Glass proudly utilizing a full line of Italian Glass fabrication equipment and a fleet of expert installers look that forward to continuing the high level of service that has been provided for the past five + decades.